There’s a strange chasm between some generations of Metalheads. Some think that they are into the 80’s (even being born in the 90’s or after them), and cast stones in the modern tendencies’ fans. As a true Metalhead from the 80’s, I’m fine with the modern sonorities, and I believe that it’s a sign of evolution. I’m also happy to see the young ones coming into Metal scene being fans from younger bands. 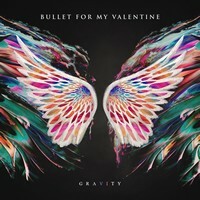 So, after all these words, what can we expect from “Gravity”, the sixth album from UK based quartet BULLET FOR MY VALENTINE? They’re into a modern Metal trend, using a fine mix between catchy melodies (just hear the choruses of their songs once and you’ll be singing with them the second time around), but with some doses of musical aggressiveness. But on “Gravity”, we can say that it’s their most accessible and introspective work to date, with some charming parts that the young ones will love, and even the use of some keyboards effects here and there. The final result is a very good album, using all their previous experience to build all these good songs. As we all could expect, the work of Carl Bown on the production and mixing (in this last part, Alex Robinson worked with Carl) kept the balance between the aggressiveness and the melodic modern side of the band’s musical work. The band used a fine set of instrumental tunes, trying to be as simple as it can be (to be played on the same way on the live shows). By the way, the legendary producer Colin Richardson produced the track “Don’t Need You”. If you’re guided by your heart (and not by rules or musical labels) “Gravity” will be in your collection. It’s an album easy to like it a lot. Songs as the fine mix between melodies and aggressiveness of “Leap of Faith” (the contrast between heavier parts with introspective one is very good) and on “Over It” (the first divulgation song of the album, that has some groove parts along the electronic effects), the harsh harmonies of “Letting You Go”, the charming choruses and vocals of “Not Dead Yet”, the dense introspective melodies of “Under Again”, and the abrasive and modern weight of “Don’t Need You” (even with the charming accessibility of it) are the finest moments of this album. “Gravity” shows that BULLET FOR MY VALENTINE is still alive. Listen to it as quickly as you can.